Ah, Trinidad and Tobago. After getting my fill of industrial San Fernando and seeing where Sean grew up up close and personal( which was awesome), we were headed “down the islands.” And this is when TT most embodied the image people see when they think Caribbean islands. Nothing but beaches, drinks and a slower pace of life. Pretty darn perfect. 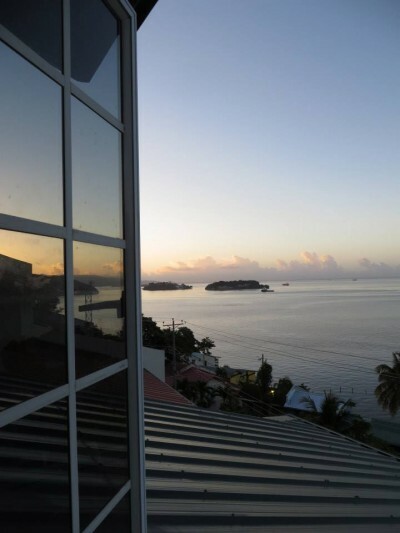 The phrase “down the islands” is unique to Trinidad, but it’s a concept that’s easy to get. Here, we typically say we’re going to the lake, the beach, the [fill in the body of water]. 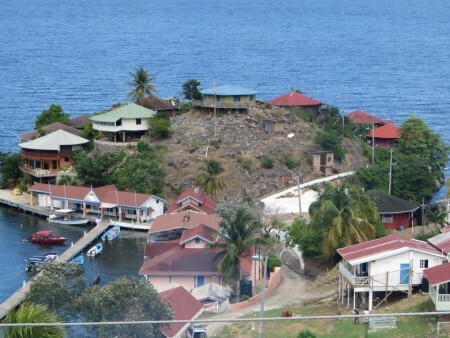 Since Trinidad’s an island surrounded by other smaller islands (plus Tobago), instead of lakes, people get vacation homes on these little islands just a short boat ride from the mainland. Down the islands was the thing Sean was most looking forward to. As he told me more than once, the islands were a huge part of his childhood – growing up, he could remember going there almost every weekend. What a life. This was the view from our balcony. Jealous yet? Another family friend of Sean’s, Gregory and his wife Allison, had recently purchased two adjoining vacation homes down the islands and since they were only using one home, they welcomed us to use the other. Truly, when you go down the islands, it’s like going to any vacation home. You bring everything: food, water, linens, towels, toiletries, soap, and a couple changes clothes and bathing suits – everything. Because once you’re on the island, you’re a boat ride away from the nearest store. It’s a short boat ride from a very nice guy named Spider, but it’s still a boat ride. Down the Islands at dawn. I’m glad I woke up to see this at least once. It was so still and unreal. 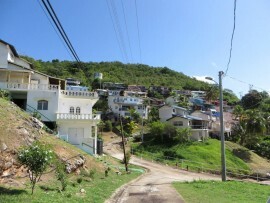 The home we were staying in was at the top of a cluster of vacation homes on Fantasy Island with a perfect view of the ocean, the boats, the ferry running between Trinidad and Tobago, some other little islands and on clear afternoons, the other end of Trinidad: Port of Spain and the southern mountain range, etc. 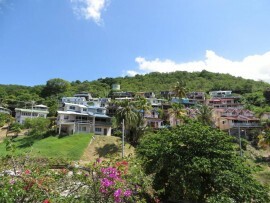 It also had great access to sea breezes and a perfect view of the rest of the little island. For two and a half blissful days, we had nothing to do but go to the beach to swim, nap during the heat of the day, eat, drink, and “lime” (the Trini word for hanging out with friends and family). 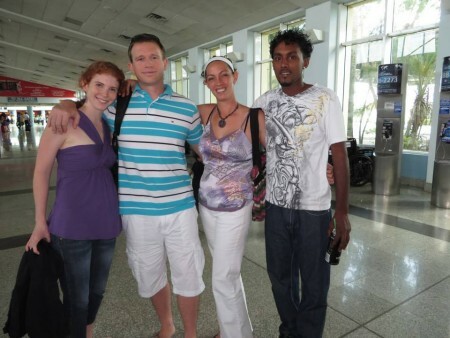 One day, Greg’s brother Doug came up, and Chervon and Ethan came too – we had a wonderful time. You won’t know until you experience it, but having no cell service, no Internet, no nothing, is incredibly liberating. It’s an all-too-rare, but nonetheless amazing, feeling. Too soon, we were repacking, calling Spider for a pick up and loading up the car back at the marina. A fraction of the homes on Fantasy Island. And a few more homes here. On the way home from the islands, we stopped at the house of one of Sean’s cousins, Kirk to visit him and his wife Angela and their two daughters, whom Sean hadn’t yet met. They were a couple of the cutest little girls, and their parents were so friendly and welcoming, even after both had worked full days. Although they only had a few hours to catch up on 10+ years worth of happenings, it was easy to see how close Sean and Kirk were growing up. Our last full day in Trinidad was spent reveling in a few more hours of responsibility-free vacation and then gearing up for one last hurrah that night, which conveniently happened to be a Friday. For this event, yet another childhood friend entered the picture. His friend Sashi was proud owner of a hot new lounge in San Fernando named, Dream, conveniently located next to a nightclub named, Metro. 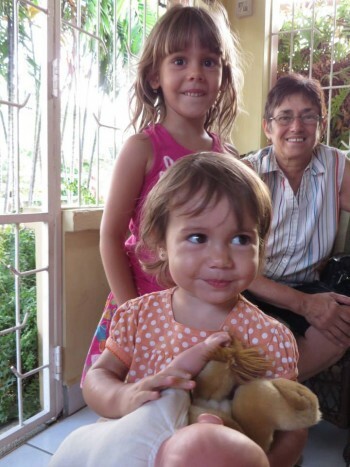 Kirk’s girls with their great-aunt Suzette. How cute. The plan was to start out at Dream, then move over to Metro once it closed. Sean, Chervon, Michael and I all drove down to Dream and met Brian, his wife Annie, and Doug. Unfortunately, after greeting Sashi at the door, he was pulled away and didn’t have a chance to lime with us that night, but we still had a great time with a bottle and a half of White Oak, numerous carafes of Coke and water, and buckets of ice. We were literally the last people to leave, and not wanting to end the night, we traipsed the 20 feet over to Metro’s entrance and the fun began anew. Like any self-respecting club, the music was too loud to hear each other, but it was a decent mix of calypso and Top 40, which was fine by me, even better, people in Trinidad (or at least my boyfriend and his friends) like to dance! We tore it up, but Brian really stole the show on the dance floor that night. Finally, everyone had had enough and called it quits. There was one last treat in store, though. Brian and Annie headed home, but the rest of us decided we were famished, and just down the road was Cross Crossing Interchange, a notorious drag racing strip as well as a place to go for super-late night eats. Five minutes later we had a number of street food carts to choose from, selling things like gyros, burgers, roti, corn soup, shark and bake, fries – you name it, it was being served. The sign of the best food cart is determined by the length of the line, so in no time, we were standing in line for chicken burgers with “slight peppa sauce.” Eating the hot burger in a paper wrapper, leaning against Doug’s car was the perfect end to an epic night. This entry was posted in Caribbean, North America and tagged Beach, Caribbean, Down the Islands, Lime, North America, Tobago, Travels, Trinidad, Trinidad and Tobago on June 13, 2014 by Paige N..